No Ice Cream on Cherry Pie??? Always remember, eating cherry pie isn’t a fattening thing to do, it’s a healthy thing to do, because cherries are so darn good for you! 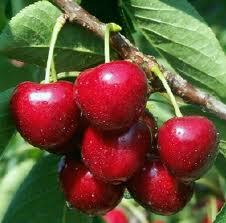 We raise all the cherries we use in our bakery right here at Seaquist Orchards, in beautiful Door County Wisconsin! It’s National Cherry Month! We love February! It’s National Cherry Month! It seems to come every February, doesn’t it? 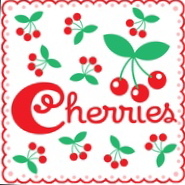 We thought it would be fun to share news, fun facts, and even fictional information regarding cherries. You may need this info some day! The view down Seaquist Road may look a bit dreary today, but we don’t mind it! Our cherries are resting, getting ready for another summer bursting with cherries, hopefully! Do you know the name of the most popular tart cherry? It makes up about 95% of the tart cherries in the world, with the Morello coming in a very distant second. It’s the Montmorency cherry! If you intend to do some baking, these tart cherries are the ones to use, because they have such a wonderful flavor! Here in Door County, Wisconsin, we at Seaquist Orchards raise Montmorency cherries, and lots of them! We have them fresh, when it’s cherry season, and frozen in a variety of sizes at Seaquist Orchards Farm Market. We also put them into our jams, pie fillings, and salsas at Seaquist Canning, along with pies, doughnuts, and other baked goods, not to mention our smoothies too! They are delicious! It’s time to eat well and be well! Buy 3 No Sugar Added jams, and receive a free delicious No Sugar Added Fourberry Jam! These delicious jams can be used in all the usual ways, or heated and used as a topping for ice cream, or even spread over chicken and baked – that’s so delicious and easy! No Sugar Added jams are sweetened with fruit juice, which means you taste fruit, fruit, and more fruit! If you have never tried our No Sugar Added Jams, – now is your chance! Use them yourself, or give them to a friend who also may want to “eat well and be well”! This offer runs from March 6 – March 17 – so don’t dilly dally for too long! Order up! This is it! The last fact! Remember to come to Seaquist Orchards Farm Market in friendly Door County Wisconsin! We open for the 2013 season on May 15, 2013, – but you can order online at http://www.seaquistorchards.com – any day, any time! You may have read some of these facts previously on this blog, – but one of them is really worth repeating. Which one? The cherry pie filling one, in particular! •Cherry pie filling is the number one pie filling sold in the US. •Tart cherries contain 19 times the of beta carotene of blueberries and strawberries. •They are also rich in Vitamin C and Vitamin E and also provide potassium, magnesium, folate, iron, and fiber. •Tart cherries are one of the few known food sources of melatonin. Melatonin is an antioxidant that helps regulate our circadian rhythms and natural sleep patterns. 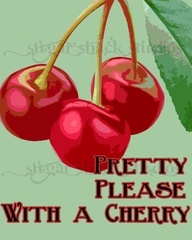 Remember, – you can order cherry pie filling year round at http://www.seaquistorchards.com. 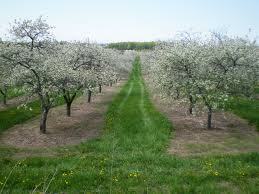 Seaquist Orchards Farm Market will open its doors for the 2013 season on May 15, 2013. The snow will have all melted by then, and you will be able to come on in and purchase pie filling right off the shelves. We are busy making filling right now at Seaquist Canning. If you are in the area, you are welcome to watch our products being made, all winter long, at our new production facility, in Door County Wisconsin. If you lined up all of the Seaquist cherry trees north to south, how far would they extend? Well – this may not be an actual fact, – but we think it’s pretty close. They would extend down towards southern Illinois!!! You will love this – and there is a bit of history behind it too! Remember, – you can order cherries online at http://www.seaquistorchards.com, from Seaquist Orchards Farm Market in wintery Door County Wisconsin! 1 Cream margarine in mixer bowl. 2 Add sugar and beat till fluffy. 3 Beat in egg, lemon peel, and vanilla. 4 Add in flour and salt. 5 Beat in water a few drops at a time until dough starts to come away from sides of bowl. 6 Place dough in a 2-quart size bag and form into a flat disk. 7 Refrigerate for a minimum of 2-3 hours and maximum of 2-3 days. 8 Roll out dough flat about an 1/8-inch thickness on a lightly floured surface. 9 Using a round cookie cutter or the top of a cup, cut out circles. 10 Spoon 2 cherries and a little bit of filling onto the dough circles. 11 To fold into the shape of a hamentashen (a triangle) use both thumbs and the two first fingers on each hand. 12 Slide two fingers from left hand under left side and two fingers from right hand under right side and two thumbs under the bottom of circle. 13 Bring all fingers (with dough) together to form a triangle and try to pinch close. 14 Repeat this process with remaining circles and dough. 15 Place on a cookie sheet lined with baking paper. 16 Sprinkle a small amount of sugar on top of each one. 17 Bake at 350°F for 12-15 minutes or just starting to turn pale golden. Cherry pitters! 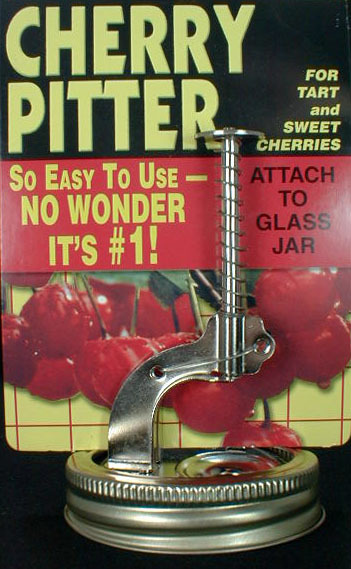 Cherry pitters have been around for many years. Check out the photo on our Facebook page – that’s a really old one! 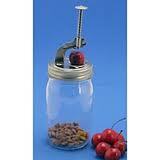 This Push Button Cherry Pitter is the one we sell at Seaquist Orchards Farm Market, in Door County Wisconsin. We think it’s the best one out there! You can order one at http://www.seaquistorchards.com. Why not get one in honor of National Cherry Month? Tomorrow – we’ll have another recipe for you! Cherry oh, see you later ! We will likely never know the whole story about George and cherries, – but you CAN know that we are running a special at Seaquist Orchards Farm Market, in Door County, Wisconsin – right now – on dried cherries! Order at http://www.seaquistorchards.com.